Durendal 104-Key | DREVO :: Game With Cool Tech. Integrated style palm rest with firm support for superior comfortable typing, gaming and programming experience. Black anodized aluminum alloy top-panel and suspended keycaps design. 16.8 million colors RGB backlight and 13 different backlit effects with 8 colors. ABS double-shot keycaps are extremely durable for solid long-term use. DREVO power console software available for backlit adjustment, Macro and key assignment. 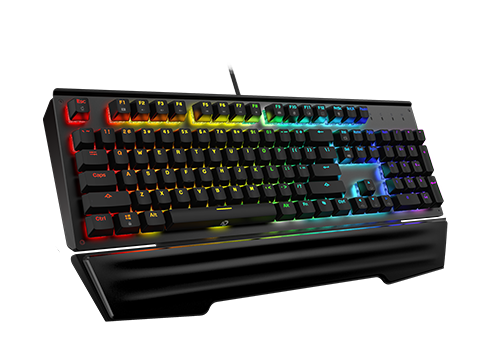 N-Key rollover and anti-ghosting allow multiple key presses to be registered simultaneously for faster gaming, typing and programming.